Whether you like to have something to eat or drink, before or after your walk, be sure to visit the catering van situated in the courtyard of the Craster Tourist Information Centre. Home of the famous Craster 'Kipper in a Bun' and the 'now' famous Auchtermuchty Sandwich. Two signature sandwiches inspired by Craster and it's beauty. Recommended by the Tourist Board and people worldwide! 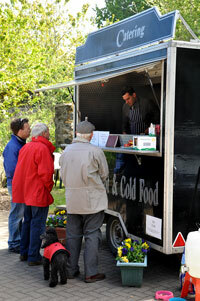 Many choices of hot and cold food all freshly cooked and prepared on order. Refreshing cup of tea or coffee and tasty homemade scones. "Best scone I have tasted in Northumberland....ever"
Visit Piper's Pitch own site. We take great pride in what we do and make sure that when you visit Piper's Pitch you will have great and fond memories of Craster.